By adopting the vinification techniques used in the Langhe wine district, The winery owner, Franco Balbiano has been able to produce a dry variant of Freisa. Traditionally , in fact this wine has always been sweet due the high sugar content but now it can also be made with more mature grapes and green tannins, thus resulting in a more sophisticated wine with low sugars. This Freisa is now a red, dry and sparkling wine which is quite unique and it is the 7% of the total Balbiano production. 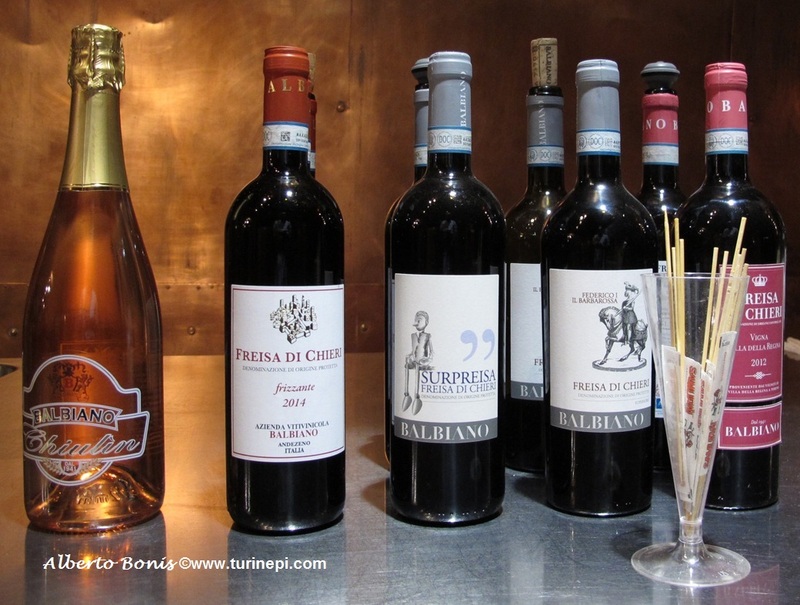 This wine is best paired with a toma di Lanzo cheese from the mountains near Turin and local salami. 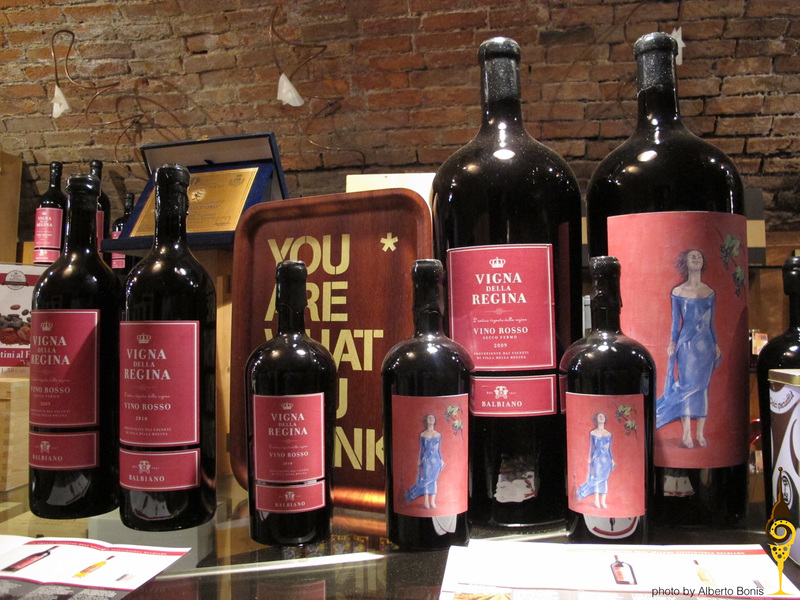 "Surpreisa" is a Freisa di Chieri still, another unusual variant for this typical frizzy wine. 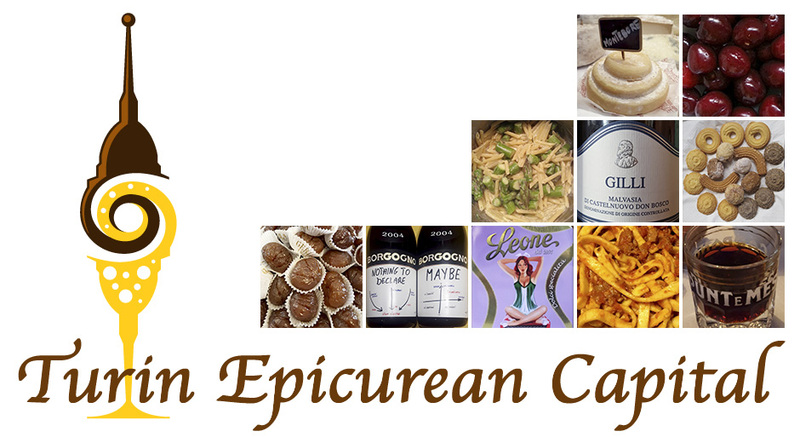 Its bouquet is very intense, structured and fruity and it's been a staple at Balbiano's since 1996. 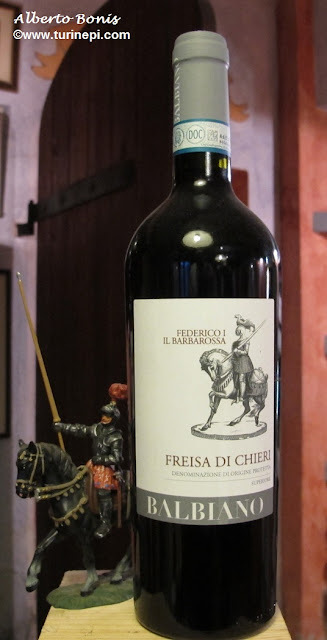 Superior Freisa di Chieri is aged for one year in stainlesss steel or wood barrels. Balbiano keeps it for 5-6 months in wood tonneaux barrels to limit the tannins and it ages it for one year in the bottle. As you uncork the bottle, it's rather earthy and sulfurous, you can definitely feel its terroir. As it breathes though it changes completely yet it keeps its full-body and tannic structure. This is a wine that needs to be savored with food to enhance both its traits and the food, as it is high in tannins it also tends to dry your mouth so meat dishes or Cajun specialties are a good match. So what about the wine from the Unesco Villa della Regina urban vineyard? Luca told us this story which sounds really more like a fairy tale: as his father was the president of the Freisa di Chieri producers' association, in 1996 he was contacted by the Italian ministry of culture to revive Turin's urban vineyard that had been abandoned since WWII. After clearing the area and reshaping the hill, not finding any original vine, Franco contacted an ampelographer to come up with the most suitable vine for the royal vineyard. 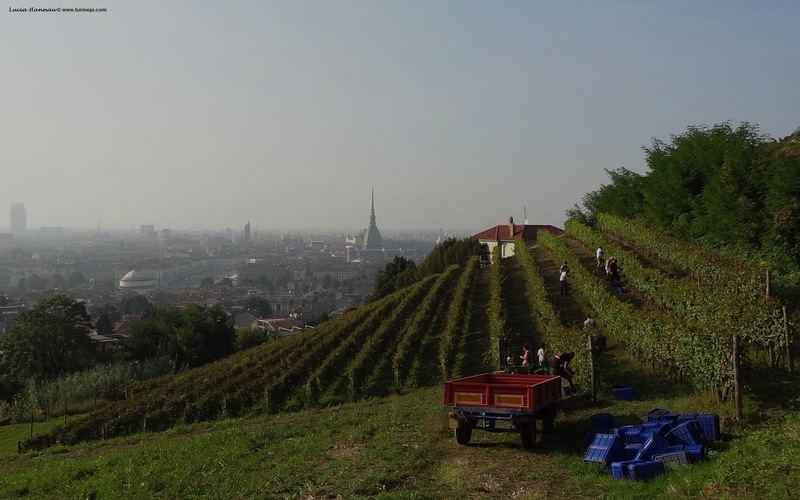 In 2003, Turin's urban vineyard at the Queen's Villa got replanted and finally, in 2009, there was the first harvest in centuries! 2011 saw the production of the first Freisa di Chieri DOC wine and this is the only DOC urban wine in the world. This urban Freisa di Chieri spends 15 days in contact with the skins which give it a more intense essence. The calcareous (chalk like) soil makes it is lighter, more elegant and less tannic than other Freisa di Chieri productions. 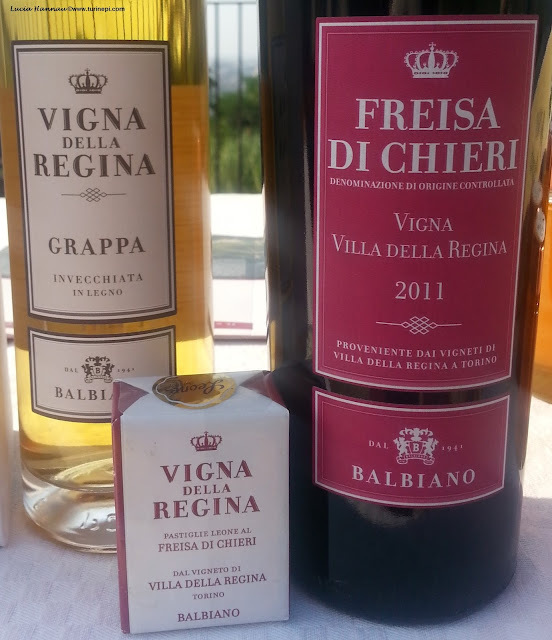 And if this wasn't enough, from the Queen's vineyard, the Balbiano winery also makes Freisa di Chieri grappa (aged in wood) and collaborates with Pastiglie Leone, Turin's candy brand, to the making of the Freisa di Chieri candies! 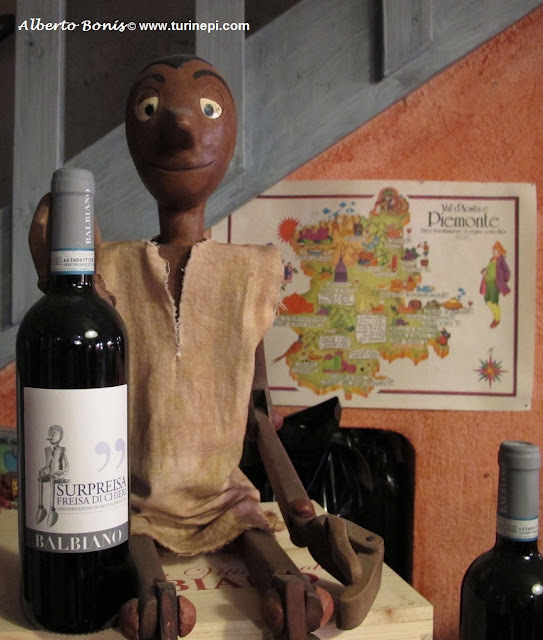 Our visit to the Balbiano winery ended up lasting some very quick 3 hours: Chiara led us by hand along the museum rooms and showed us the toys and the country tools, and then Luca took over and guided us through our senses and his family wine making tradition and style. 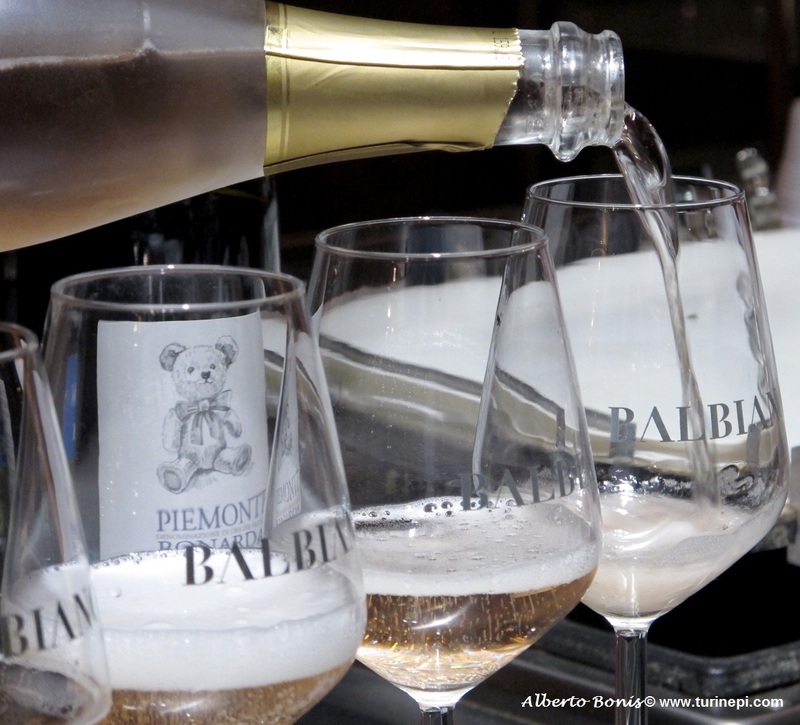 It is amazing the treasure a winery can hold and most definitely the Babiano winery is totally worth a visit when you are in Turin!